I so enjoy preparing my summer vegetable garden even though my modest crop is limited to herbs, a variety of tomatoes, and zucchini. Why zucchini you ask, I mean don’t you live in California where this is readily available? Of course I do but two zucchini plants per year provide me with a healthy production of delicate zucchini blossoms. Every so often I seem to miss the precise moment to harvest, and magically zucchini seem to appear in abundance. I beg you, please do not suggest that I begin large scale production of zucchini bread as this, in my humble opinion, is generally a gummy tasteless substance, primarily an unnecessary caloric blunder. Combining flavors which pair naturally; zucchini, parsley, garlic, lemon and Parmigianino results in these delightful little morsels, which are perfect with a late afternoon glass of wine. To make it even better – they are baked, yes baked. A simple substitution of either cornstarch or potato flour for all purpose flour allows the fritters to be gluten free. The Braised Lemons add a subtle infusion of lemon essence. Using either a hand grater or a food processor, grate the unpeeled zucchini using the medium setting. Place the grated zucchini along with the 2 Tbs. of salt in a colander over a large bowl or in the sink. Cover the zucchini with a clean cotton towel and place a heavy weight over the towel. Allow the zucchini to drain for one hour. After one hour, rinse the zucchini under cold running water, press as much of the water as possible out of the zucchini. Lay the grated zucchini on a second clean cotton towel and wrap tightly, extracting as much water as possible. 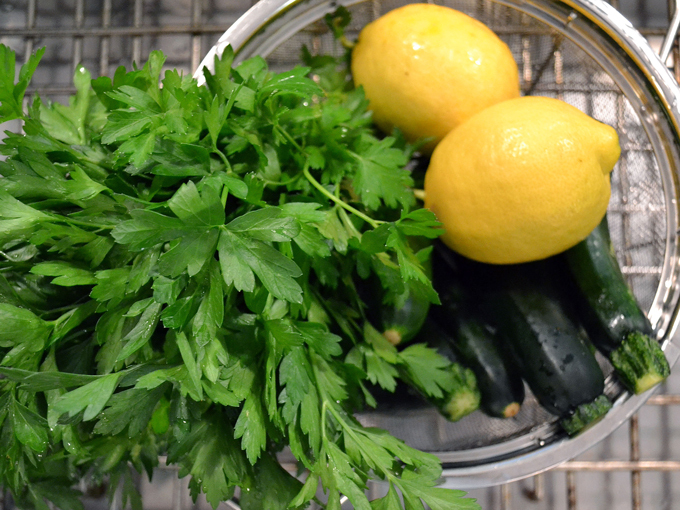 Place the zucchini in a large mixing bowl, making a well in the center. Preheat the oven to 400º F. Line two baking sheets with parchment paper. Place the beaten eggs, flour, corn meal, baking powder, lemon peel, parsley, Parmigiano and garlic in the center of the well and beat lightly with a fork. Combine with the grated zucchini, the mixture should resemble a thick cake batter, if not, add a few more tablespoons of flour. Form patties using about 2 tablespoons of the batter and place onto prepared baking sheets. Place the baking sheets into the preheated oven and bake for 15 minutes or unit the bottom is golden brown, flip the patties and brown on the other side. Remove from the oven. The patties may be cooled and stored in the refrigerator to be used the next day if desired. Place the ⅓ cup of extra virgin olive oil in a small sauce pan, add the sliced lemons and simmer gently until soft - about 10 to 15 minutes. This may be prepared in advance and lightly reheated. 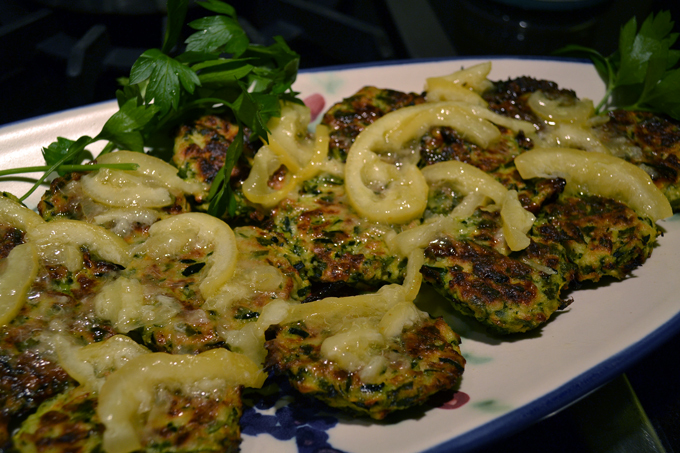 Platter the warm zucchini fritters, topped with a bit of the braised lemons, and garnish with a few parsley sprigs. *To reheat the fritters preheat the oven to 350º, arrange on aa baking sheet and heat until hot, serve and platter as indicated.